As I mentioned in my last post, another of Gus’s previous owners just happened to be in town and wanted to come see Gus. Here’s the lineage so you can keep track: Ryan (he of the buffalo tale mentioned here and painter of the “spots” that used to adorn Gus when he was known as the “Bull Bus”) sold Gus to his friend Joe, (who came to visit yesterday) who sold Gus to Thomas, (who Joe used to work with) who sold Gus to me. Ryan and Joe both found me on Facebook, and it’s been really fun catching up on the old stories of the “Bull Bus” as they still refer to Gus. So yesterday Joe happened to be in town (he lives in North Carolina where we used to live) and wanted to come see Gus. Little did I know he would be arriving in a bus of his own – a 1971 Westfalia. 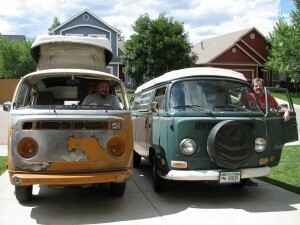 The ’71 used to be Joe’s brother’s bus, and Joe was in Colorado to pick up the bus and drive it back to North Carolina. 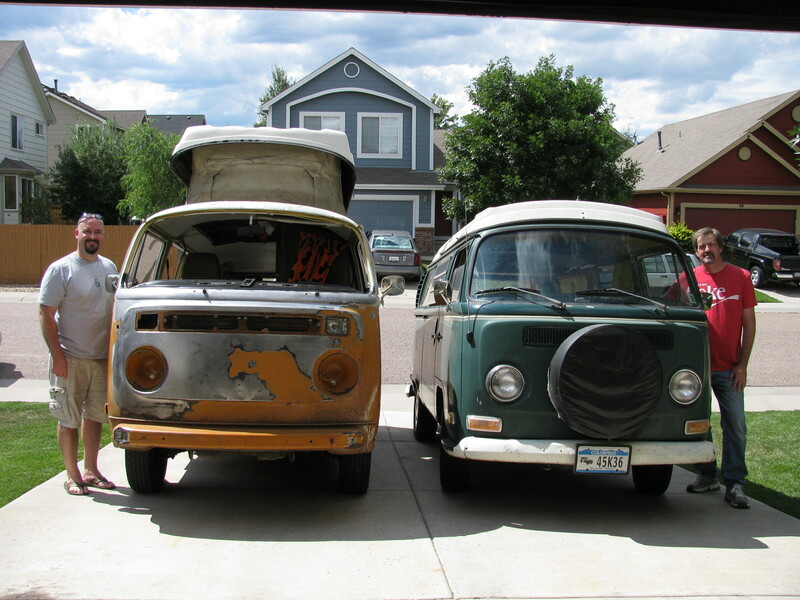 The ’71 was the start of the “bus fever” for Joe way back in the 80s…he and his brother went on many adventures in the ’71, and those adventures were the inspiration for Joe to eventually buy Gus from Ryan. Joe and Ryan are friends, and Joe bought Gus from Ryan when they lived in Washington state. Keen readers will notice in the early pictures of Gus he was wearing Washington license plates. 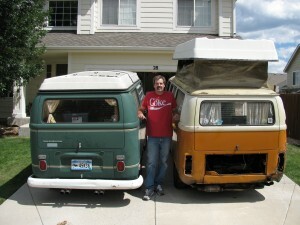 Joe moved to North Carolina, and drove Gus all the way from Washington to North Carolina. Shortly into the trip the starter stopped working, so Joe had to park on hills and pop the clutch almost all 3000 miles of the trip. Seems to be a recurring theme with Gus. Joe did eventually get the starter replaced. We had a good chat about the history of Gus. I haven’t changed too much of Gus since Joe owned him, so it was cool to see Joe’s reaction to certain things that are still in the bus. Like the Mt. Vernon, WA library magnet still on the refrigerator, or the Flintstone curtains that Ryan’s dad made. 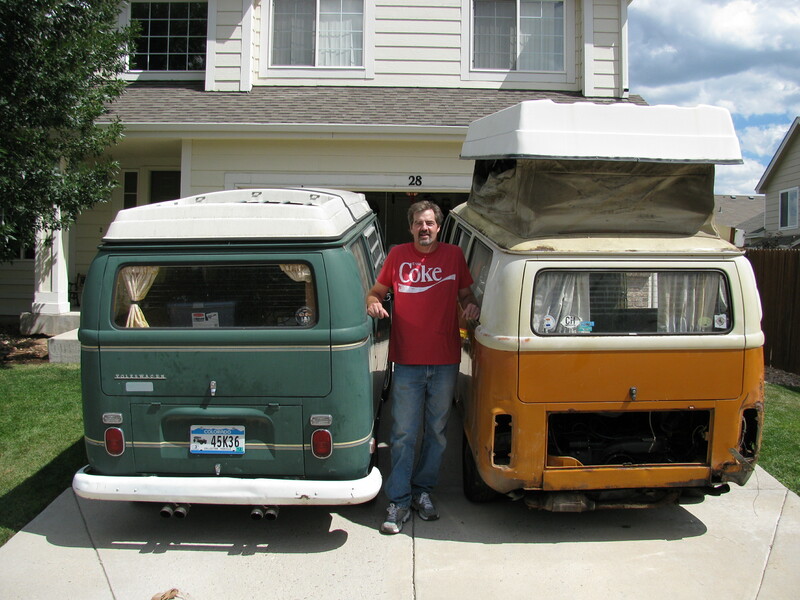 I still had the Washington license plates that were on Gus when I got him, so I gave one of them to Joe…since they were the plates on Gus when he owned him. There’s so much history in this bus, and I’m just the current curator.